Spend three nights each in Rome, Italy's "Eternal City," and beautiful Sorrento where you'll create lasting memories of Italy. “Che sarà sarà.” This Italian proverb says, “What will be, will be.” While we believe this is a good attitude to have about life, we don’t take this attitude with your vacation to Rome and Sorrento. Instead, we’ve looked into every detail, handled all the logistics, and left nothing to chance. That’s why on this 7-day vacation, we've arranged your hotel reservations, daily breakfast, sightseeing, transportation between cities, and transfers from/to your hotels to/from the train stations. Plus, we’ve arranged the services of a local host in each city, someone who is there for you throughout your stay to answer questions, offer guidance, help arrange your activities, and ensure that your vacation runs smoothly. Your vacation begins the moment you arrive in Rome, where we can pick you up at the airport and take you to your selected hotel. Here, your host will be waiting for you to help you get settled and to give you a packet of information to familiarize you with the city. The next morning, after included breakfast, we’ll pick you up at your hotel for guided sightseeing of Rome's famous landmarks. 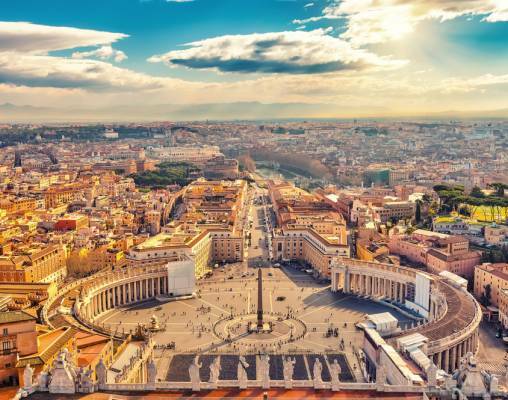 With an expert local guide, we’ll take you to visit the Vatican Museums to see its amazing treasures; the Sistine Chapel, where the Conclave is held to elect new popes and where you’ll view Michelangelo’s The Last Judgment; St. Peter’s Square and Basilica, where the Pope often presides; the iconic Colosseum, built in the 1st century and famous for its gladiator fights; and the Roman Forum, where you’ll see the oldest structures of the ancient city. In Sorrento, your sightseeing with a local expert highlights this beautiful town. Hear inside stories and little-known secrets as you walk along the Old Town and visit the cloister of St. Francis Church. We've also secured a limoncello tasting for you. 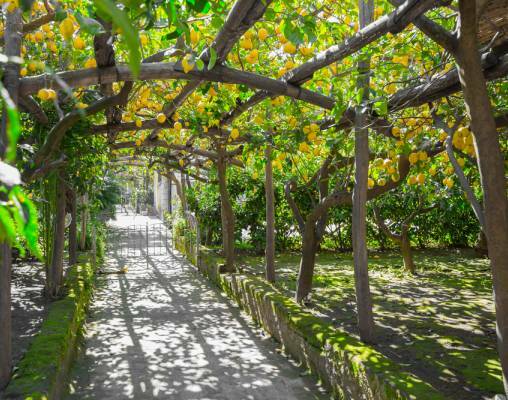 This world-famous liqueur is made with Sorrento’s lemons. In both cities, you’ll have a free day to explore on your own. The possibilities are endless in Rome, but don't worry—your local host will have lots of suggestions and will be able to help arrange activities for you. 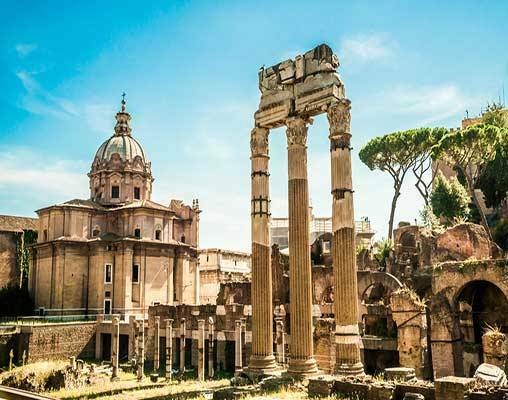 You may want to visit Rome’s catacombs, take a cooking lesson with an Italian chef, shop at the designer Italian boutiques along Via Condotti, or explore Rome’s famous piazzas while enjoying its mouth-watering cuisine. In Sorrento, perhaps take an excursion to Pompeii to see what life was like in 79 AD before Mount Vesuvius buried the town, visit the nearby jet-set Isle of Capri, or shop at the local boutiques. Your morning guided sightseeing, with headset, is rich in religious and ancient history. Visit the Vatican Museums to see its amazing treasures. In the Sistine Chapel, where the Conclave is held to elect new popes, view Michelangelo’s The Last Judgment and his famous ceiling paintings. Also on the agenda today, enter monumental St. Peter's Square and Basilica, built in 313 AD above St. Peter the Apostle’s tomb and home to Michelangelo’s masterpiece Renaissance sculpture, the Pietà. 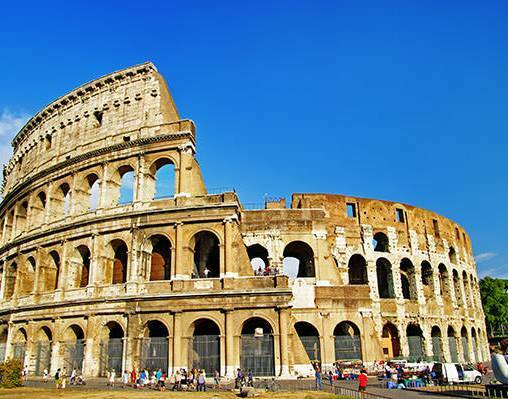 Cross the Tiber River and continue your immersion in history at the iconic Colosseum, built for 50,000 spectators, and the Roman Forum, where the oldest structures of the ancient city are located. 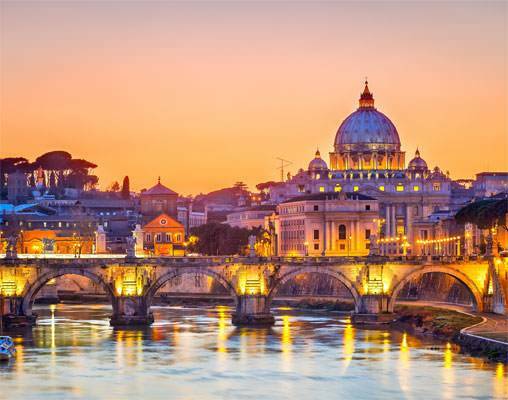 Spend a full day at leisure, enjoying the capital of Italy. Perhaps relax in Gianicolo Park with its panoramic views, carousels, and puppet shows; or shop along the famous Via Condotti with its famous boutiques. Your local host has many suggestions for you. 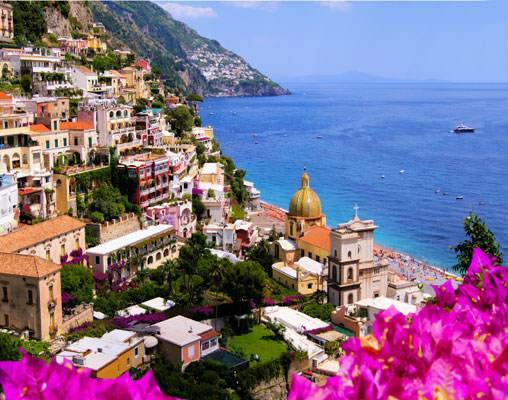 Travel by high-speed train (first class) to Naples, and transfer to your hotel in beautiful Sorrento. Morning guided sightseeing includes a walk along the Old Town's characteristic lava-stone streets and time to take pictures of amazing Mount Vesuvius. See the 14th-century Sedil Dominova building; the ancient Bell Tower; and St. Antonino Church, dedicated to Sorrento’s patron saint. Visit the Cloister of St. Francis Church to enjoy its unique atmosphere and tranquility. Taste limoncello and find out how this world-famous liqueur is made. 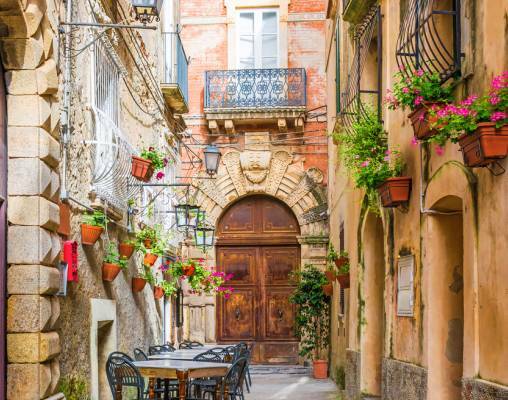 Your local host can give you ideas for your day at leisure in this enchanting area; and be sure to try the favorite local specialties—spaghetti alle vongole (spaghetti with clams) and pastiera (ricotta cheese-filled cake). Located in a good position close to the National Museum of Rome, the Opera House, the basilica of Santa Maria degli Angeli and the Termini Train Station. Via Nazionale, a famous shopping street where many cafés, bars and trattorias can also be found is within easy reach of this property. As indicated by the prefix of its name, this property is the stronghold of artists and arts aficionados who retreat here to isolate themselves from the crowds of the town and benefit from the breathtaking view as well as the large swimming pool and vast sun bathing areas. The hotel offers non stop bar and restaurant services either in the main dining room or on the pool terrace. Free Wi-Fi access is available in all guestrooms and public areas of the hotel. There is a small fitness center, a piano bar and a traditional Italian restaurant featuring rotating chefs from the region that allow for ever original and fresh menus. 24th April 2019 $1,418 Please call for availability. 1st May 2019 $1,534 Please call for availability. Enter your details below if you would like to be notified when 2020 dates and prices are available for Rome & Sorrento. Prices are correct at the time of publication, however are subject to change at time of booking. Hotel and Rail accommodations listed above, are subject to change based on availability at the time of booking.